We are here to service your needs for speakers at your conference, meetings or training events. We have a variety of speakers who are all well-trained, experienced presenters. Our speakers communicate to inspire and entertain in order to leave a moving and lasting message. As we are a not-for-profit organisation these services are here for you and your organisation free of charge. Please have a look at our speakers page and contact us to book your professional presenter. Do you have the goal of becoming a professional speaker. 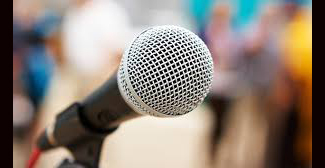 Learn the craft of keynote speaking and help in developing your speaking profile. We have members who can speak on a variety of topics to suit your event. Please have a look at the profiles available. The MC can make or break an event. We have members who are experienced in managing small and large events. These are evening meetings. Please arrive at 6pm to meet and greet. The presentations commence at 6:30pm sharp. The meetings are designed to develop and showcase keynote speeches for up and coming professional speakers. The meetings also contain marketing development strategies and how to improve your speaking profile.